Environmental impact documents reveal a proposal for a launch control tower up to 300 feet tall for launches and landings, a rocket garden to show off the company’s historic space vehicles, a new security office, a 280,000 square foot utility yard, and a 133,000 square foot rocket processing and storage facility. The proposed buildings and the associated lot would all be on a piece of land nearly one mile long by a half mile wide. Previously, President Gwynne Shotwell had said the company is planning to increase its launch rate by 50 percent this year. In comparison, SpaceX had 18 launches last year. 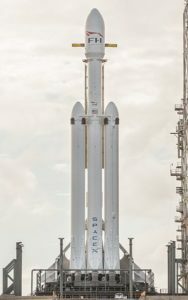 The company is planning to handle 10 Falcon Heavy launches per year and up to 63 landings which means SpaceX is seeking to double the number of launches and landings from last year. The future landings include Falcon 9 first-stage and Falcon Heavy, during which boosters will land either at sea or back at Cape Canaveral. The company currently has more than $10 billion launches under contract. SpaceX needs more space to handle the growing number of launches and reusable rocket hardware.